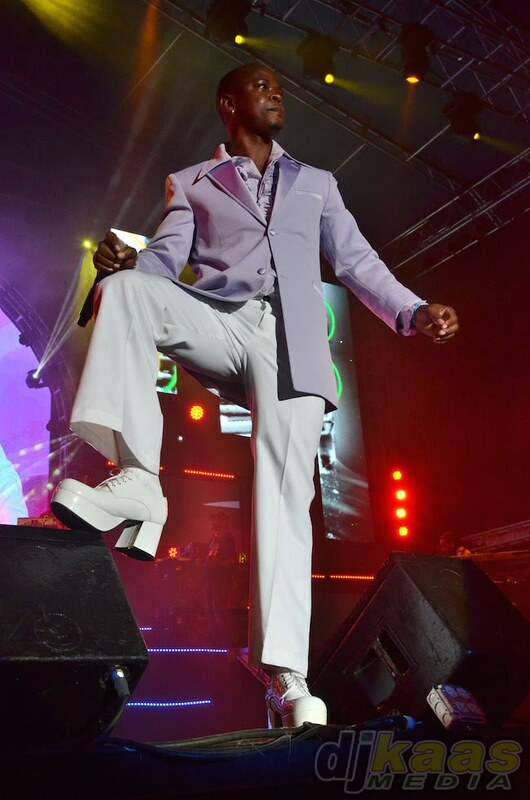 After almost ten years absence Dancehall Superstar Mr. Vegas returned to the Reggae Sumfest stage with a bang proving why he is still one of the most sought after dancehall artistes on the international tour circuit. Dressed in a classy retro ensemble featuring a Lavender jacket, big heel boots and bell foot pants, Vegas was a showman exemplary; demonstrating master control of the stage and exciting exhibition of the dancehall art form. He dressed the part to go with his performance that had all the elements of our culture; from Gospel and foundation reggae to dancehall and comedy. The Modern veteran also showed the crowd the he is verse and can write lyrics for any occasion, keeping it entertaining. Mr. Vegas who blessed his set in prayer before entering the stage area then belted out his signature I am Blessed hit and had the Sumfest Dancehall Night crowd eating out of his hands as he turned the pages of his repertoire. Collecting huge forwards for the likes of Heads high, Nike air, hands up, and Raffle and Dip, Mr. Vegas says he is humbled by the tremendous welcome and acceptance given to him by the Jamaican Fans. The international star brought Catherine Hall audience to a frenzy when he called on his MV Music artist Latty J, and went into a battle of the sexes with the track Who Rule. Latty J could do no wrong, as she and Mr Vegas gave the audience a brilliant and witty clash. Mr. Vegas was happy with his performance, “I want to big up every artist that performed. It was a great effort on our part to entertain the audience. Some people are saying Vegas took the show and I am grateful and humbled for being mentioned. However, my priority is not about taking the show, my main objective is to give the people a great performance, so big up all the artists that performed on Sumfest 2014”. Mr. Vegas got a stamp of approval by Beenie Man and most people at the end of the night. As a Special surprise to the Sumfest Fans the artiste was also brought onstage on Reggae Sumfest International Night 1 by R & B Superstar Jason Derulo for their reggae remix of Jason Derulo’s mega hit Talk Dirty To me. Now basking in the renewed respect gained from this massive performance, Mr. Vegas is confident in the way forward and feels vindicated for sticking to his principles: “My fans can expect only positive vibes from me moving forward. The focus is now on Latty J, Team Hustle and my own career especially my reggae album Euphoria scheduled for September release. We will be doing an album launch in Jamaica as a tribute to the fans who have supported me over the last 17 years. 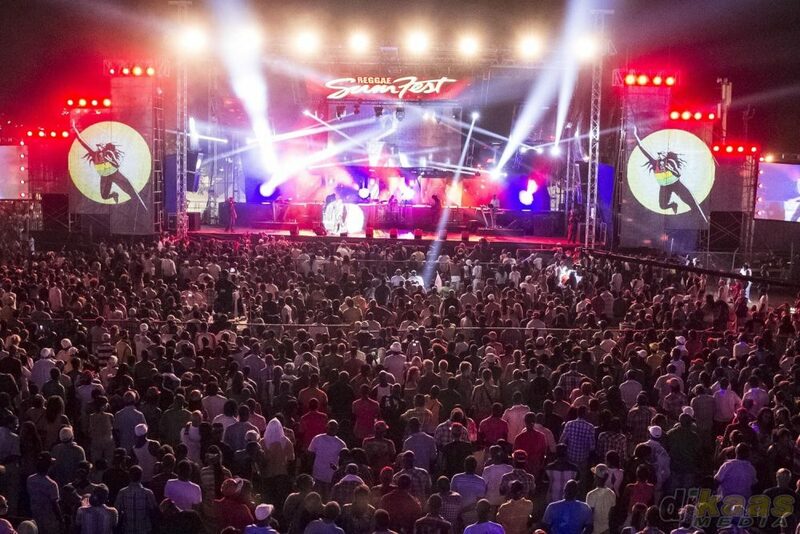 Watch Reggae Sumfest 2014 Dancehall Night’s full show here.